Item # 309610 Stash Points: 1,995 (?) This is the number of points you get in The Zumiez Stash for purchasing this item. Stash points are redeemable for exclusive rewards only available to Zumiez Stash members. To redeem your points check out the rewards catalog on thestash.zumiez.com. 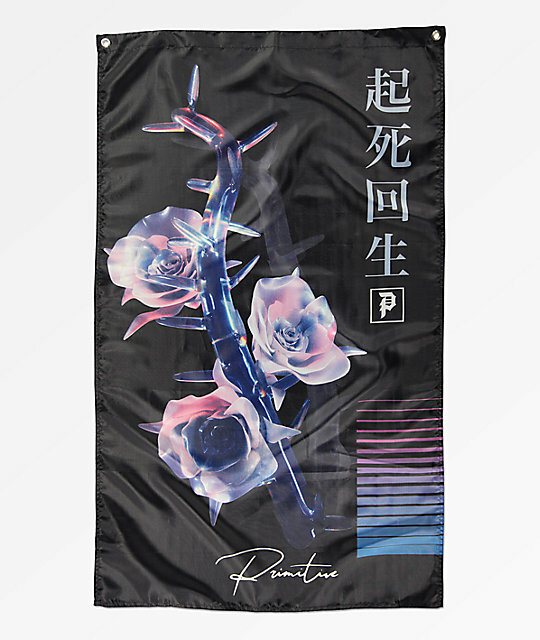 Step up your interior decorating skills with the Primitive Creation Black Banner. This 3 by 5 foot design features the image of a rose bush surrounded by Japanese text detailing and stripe print. Creation Black Banner from Primitive. Overall black colorway with Japanese text graphics throughout and a rose plant surrounded by purple and blue stripe detailing. 36" x 60" (3 x 5 ft.) approx.